• Make a budget on what you want to spend during the holidays and stick to it. 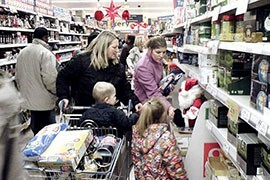 • Take time to compare prices between stores. • If you use a credit card, pay it off quickly. • Start saving now for next year. WASHINGTON – Holiday spending will see a “modest bump” this year, but will be held back by budget concerns of those at the lower end of the income scale who have not seen salaries grow like those who are better off. That was the finding of the annual forecast of holiday spending released Monday by the Consumer Federation of America and the Credit Union National Association. 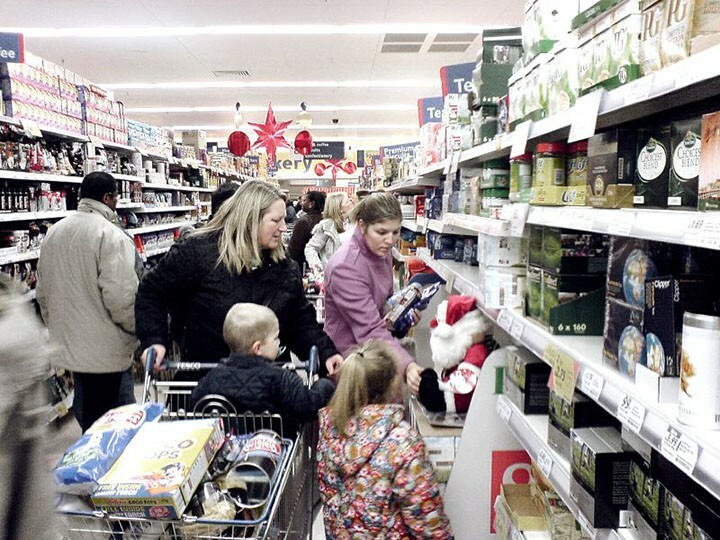 While lower unemployment and higher stock prices signal an improving economy and should translate into more spending on the holidays, it appears that will only happen among those who have more to spend, the report said. That is likely to hold true in Arizona as well, where some people are still working to get out of the hole they found themselves in during the recession. “A lot of people in Arizona got caught up in high-debt situations,” said Kelly Griffith, executive director for the Tucson-based Center for Economic Integrity. The center is affiliated with the Consumer Federation of America. The CFA and CUNA conducted a nationwide telephone survey of 1,009 people, by landline and cell phone, between Oct. 30 and Nov. 2, to get its outlook for the coming holiday. The survey found that while higher-income earners will be spending more this year, most consumers will spend the same as they did during the recession. It said that just 22 percent of those earning less than $25,000 a year had seen their income grow over the last year, while 45 percent of those in the six-figure range have more income now than they did a year ago. 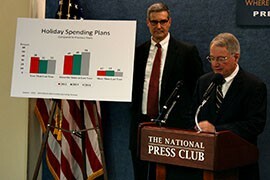 That lack of upward income mobility translates to more conservative holiday spending nationally, Schenck said. CFA Executive Director Stephen Brobeck believes the report’s findings illustrate the widening income gap in this country. In Arizona, the boats have barely moved at all. The Census Bureau’s American Community Survey reported in September that Arizona’s median income only changed by $10 from 2012 to 2013 – and that change was downward, from $48,520 to $48,510. Griffith noted that many people in the state are still struggling to make payments on things like high-interest mortgage loans, which means most Arizonans will likely do their holiday shopping with a close eye on the budget. “Arizona consumers are not going to be spending as much because they don’t have as much,” she said. Overall holiday spending is expected to be up from last year's levels, but only because of higher-income Americans. Most people said they expect to spend the same or less as last year. 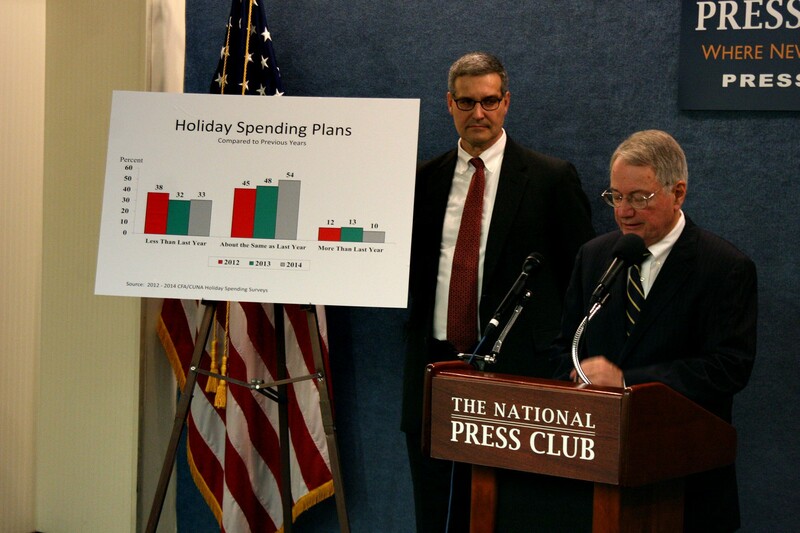 Stephen Brobeck, right, of the Consumer Federation of America and Mike Schenck of the Credit Union National Association deliver the 2014 outlook for holiday spending, which is expected to be slightly higher than last year.